BabyBjörn has been working for a long time to support parents and design products to make their everyday lives easier and more fun. 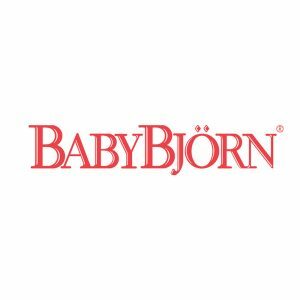 With the new Be You collection, BabyBjörn is encouraging parents to trust in themselves and celebrate the freedom to simply be themselves. BabyBjörn is challenging the social stereotypes and focusing on parents’ self-belief. The A/W collection showcases new colours of the award-winning, and beloved Bouncer Bliss and Baby Carrier One. Every day, BabyBjörn meet and talk to families and parents all over the world, and many admit to feeling under pressure or unfairly judged in various ways. Parents feel the need to be perfect, and are bombarded by stereotypes that don’t reflect the reality and diversity of our modern society. BabyBjörn feel that we should all be more accepting and respect the equality of all people; we should recognise that every parent and every child is different. As a company, we have a great responsibility to send this message – and especially for our future generations. ‘We’re not using models for this campaign, we’re featuring real parents with their own children. This is another way of underlining the importance of being you. There are no perfect parents – just real ones. And in the images, we want to show people as they really are and create a sense that we’re all fine just the way we are,’ adds Art Director Karin Hoxter, the designer behind the new Be You collection. ‘This is a topic we feel passionate about. We’ve created a campaign designed to increase acceptance of the fact that we are all unique, we make different choices and have our own styles. Nobody should have to pretend to be somebody they’re not. 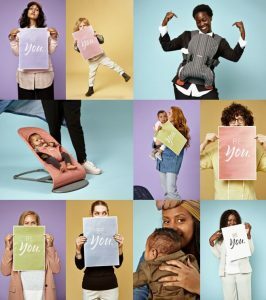 Each one of us should be able to trust in our own abilities and instincts when it comes to parenthood too,’ believes Charlotte Smirnova Lindblom, lead copywriter for the new Be You collection. ‘The colour palette in the new collection ranges from classic grey pinstripe to on-trend lavender violet. We wanted to create a colour scheme and good mix that reflects diversity and expresses the freedom to choose the one you like,’ says Karin. The Be You collection, in new colours, features our popular best-sellers Baby Carrier One, One Air and Bouncer Bliss. The collection is a limited edition and the new colours are; Lavender violet, navy blue, vintage turquoise, terracotta pink, dusk blue, and pinstripe/grey. Please contact nikkifox@clareville.co.uk for more info, images or samples.